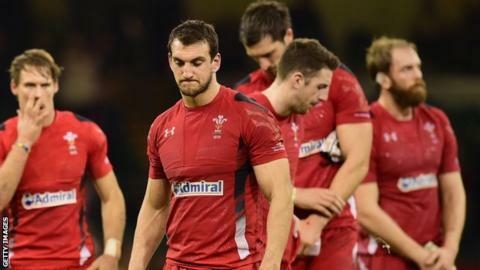 Captain Sam Warburton says Wales must finish matches stronger to end their wait for a southern hemisphere scalp. A late flurry of New Zealand tries saw Wales lose 34-16 to the All Blacks. Warren Gatland's side have won only one of their last 27 matches against New Zealand, Australia and South Africa, who they face on 29 November. "The most important part of a Test match is the last 10 minutes, and that's where we need to improve," said Warburton. The closing stages of matches have been a weakness for Wales in recent meetings with southern hemisphere sides. They were dramatically denied a first Test win in South Africa in June, and were edged out 33-28 by Australia in the first of their autumn internationals. On Saturday Wales led New Zealand 16-15 after an hour, but the All Blacks scored three tries late on to seal victory. "You've got to give New Zealand credit for the way they played the last 10 minutes," said Warburton. "They put the ball through hands and got a couple of tries. "I'm still very proud of the effort of the players." Wales take on South Africa in their fourth and final match of the autumn series on Saturday, 29 November. Although Wales have not beaten the Springboks since 1999, Warburton believes a similar performance could end their wait for a victory. He added: "If we take the same effort and energy into next week [against South Africa] we'll come away with a win I'm sure."